Dr. Matthews’ favorite meal EVER. Cooking for Dr. Matthews is great. He is a tall thing who works out regularly, thus maintains a healthy appetite and a great appreciation for foods of all varieties. Cooking for hungry and non picky eaters is so very rewarding! Thankfully, Dr. Matthews is also honest in his reviews of the recipes I try. I often ask him if something’s a “make again” meal, or to rate it on a 1-10, which he will obligingly do. 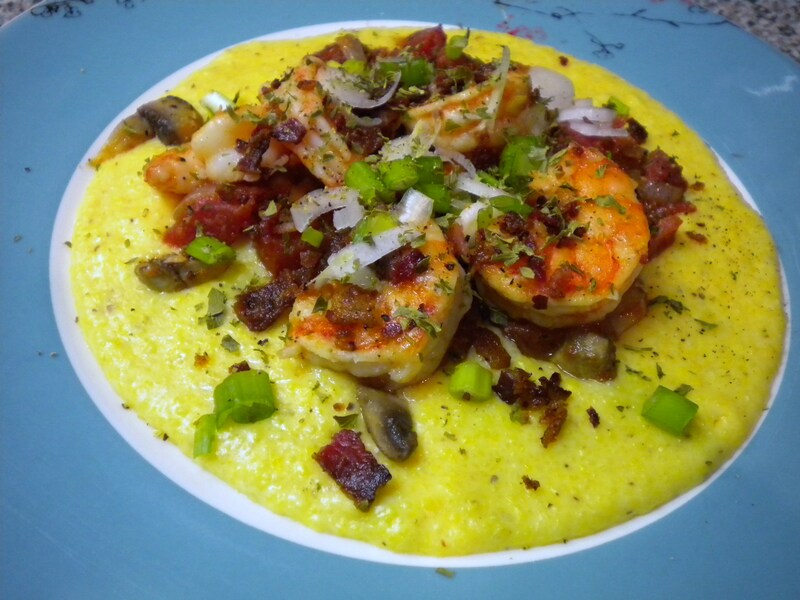 The first time I made shrimp and grits, before we moved south, Dr. Matthews was pleasantly surprised by this combination, which he hadn’t thought he’d like so much. I had somehow gotten by without making it again since we’ve moved south and thought it was about time I do so. Bring the chicken broth and milk to a boil in a heavy-bottomed saucepan. Stir in the grits and simmer over medium heat, stirring frequently, until they begin to thicken and soften, about 30 minutes. You may need to add more milk as you go. (I added a good deal more milk and turned the heat down a bit, as the grits appeared to be scorching at the bottom of the pan/drying out.) 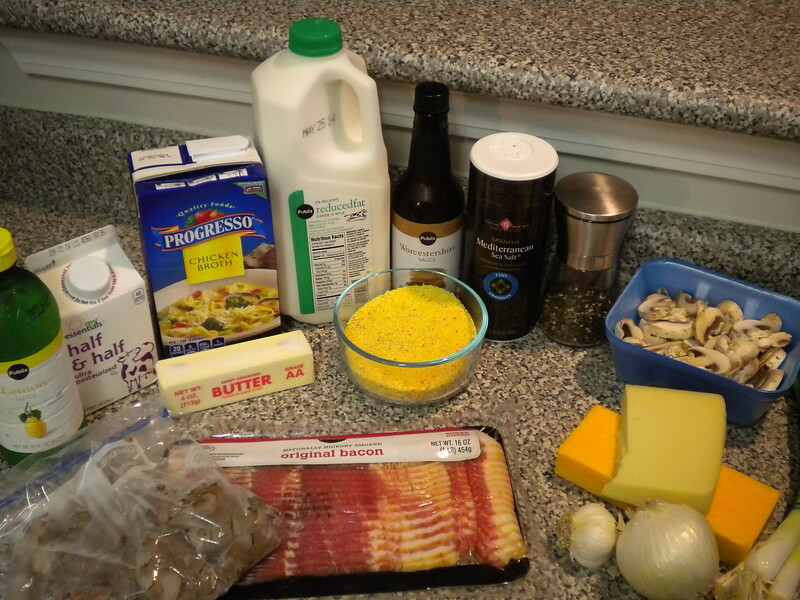 Stir in the cream, butter, garlic salt, ground pepper to taste and cheeses and continue to simmer until the grits are soft and creamy and the cheese is melted. Stir frequently because milk solids burn easily. Saute the bacon until crisp. Remove from pan and crumble. Add onion and garlic to the pan and saute in bacon grease until the begin to soften, about 3 minutes. (I always add the onion a bit before the garlic, as garlic tends to cook faster.) Add the mushrooms and saute until they begin to soften, about 3 minutes. Add the tomatoes, crumbled bacon, Worcestershire and lemon juice. Simmer for 5 minutes to blend flavors. Add the shrimp and saute, stirring, until they turn pink. Season to taste with salt and pepper. I cannot wait to see what you cook for us when we all head to the Gulf! P.S. They sell fresh shrimp down there too!